The comfort of the animal in the inside of the premises can be obtained through several ways. The options range from the adoption of technical concepts in sizing the premises, taking full advantage of, for example, the natural winds, or through the air conditioning. We can say that the efficient control environment can employ natural or artificial systems. Natural control methods involve afforestation around the facilities, open sheds, height of the right foot, site selection, longitudinal orientation of installation in East-West direction, reflective roofs, wide eaves and presence of cupola. The mechanisms are basically artificial ventilation and the adiabatic evaporative cooling systems (SRAE), which are mechanical systems to reduce the temperature of the environment with the use of water vapor acting as cooling element. Get adequate ventilation within an installation is of extreme importance, as this ensures the removal of moisture, dispersion of gases and excess heat. The ideal is to maximize natural ventilation of premises. When minimum rates of winds are guaranteed there is possibility to renew the air and thus limit the rise in temperature within the same. -avoid use of structures on the roof and the exaggerated use of afforestation around the installation. 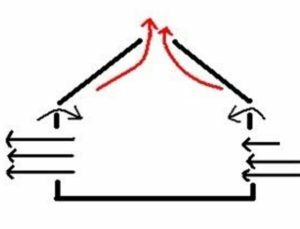 It is worth mentioning that natural forces available for increased air movement are due to the action of the wind through the openings of the installation and of the temperature difference between the inside and the outside. The adiabatic evaporative cooling system (SRAE) can be applied in various facilities: nebulization, equipment and sprinkling in animals, achieving reductions of up to 6° C internal temperature of premises (in dry climates). However, there is an issue related to regions with high relative humidity, where the system should be intermittent, avoiding excessive relative humidity, also harmful to animals (SCOTT, 1998). View on problems and high levels of relative humidity in the article: “do you know what are thermal comfort zone and temperature and humidity Index?”. The difference between the “misting” and “fogging” is basically the size of the drops. The system “fogging” is the most efficient method of cooling the air by the smaller size of the drops, however it is more expensive than the “misting” and requires greater maintenance. Misting systems, small water droplets are sprayed into the air, cooling, evaporating. When the animal inhales the air cooled, there is Exchange of heat with the air fresher and therefore removal of heat from the body. The great advantage of the misting system in relation to the spraying is that, when well set, keep the floor dry. A nebulizer well calibrated, with clean water, is able to share a drop of water in approximately 611 droplets with diameter of 0.5 millimeters, enabling an increase in the area covered by the system. The misting line must be installed separately from the vent line, which promotes greater air movement, and to a reasonable height (about three metres). Higher efficiencies are found in high pressure fogging (“fogging“), in which the size of the droplets is reduced, increasing the area covered with the same volume of water and also the time in which it remains floating before reaching the ground, favoring the evaporation. Sizing is needed for each installation type, size and number of nozzles, number of rows, positioning of the lines and calculation of operating system burst, avoiding the excessive increase of the relative humidity. Again: random installation can cause increase in relative humidity, harming animals. Studies in Florida showed an increase of 11.6% on milk production of cows estabuladas in “free-stall” air-conditioned with ventilators and nebulizers (table 1). The system was mounted on top of the feeding trough. Ventilation was continuous, with an air velocity of 3 m/s, and controlled by a thermostat that made her stop when the temperature reached 22.2° c. The nebulisers if they located below the blowers, being scaled not to wet the bed, being controlled by a thermostat and a timer, that acionavam at intervals of 1.5 min every 15 min, when the temperature was between 24.4° C and 25.6° c.The spent water was about 216 litres/day/cow to the cooling system, providing satisfactory results. However, the proper choice of nozzles and the range of application of nebulization time may reduce the expense with water to 70.7 litres/cow/day, maintaining an adequate cooling to the cows. In the next article will be presented practical and theoretical aspects on the use of sprinklers.